Early in the year, the Rotary Club of Manchester Trailblazers was approached by Marie Curie looking for volunteers to help with their Great Daffodil Appeal. Having supported Marie Curie in the past with fundraising from a Glow in the Park fun run, we were more than happy to help. Unfortunately, many of our members were away the weekend of the bucket collection so we reached out to the local Rotaract club for support and they delivered spectacularly, with 5 Rotaractor's signing up. 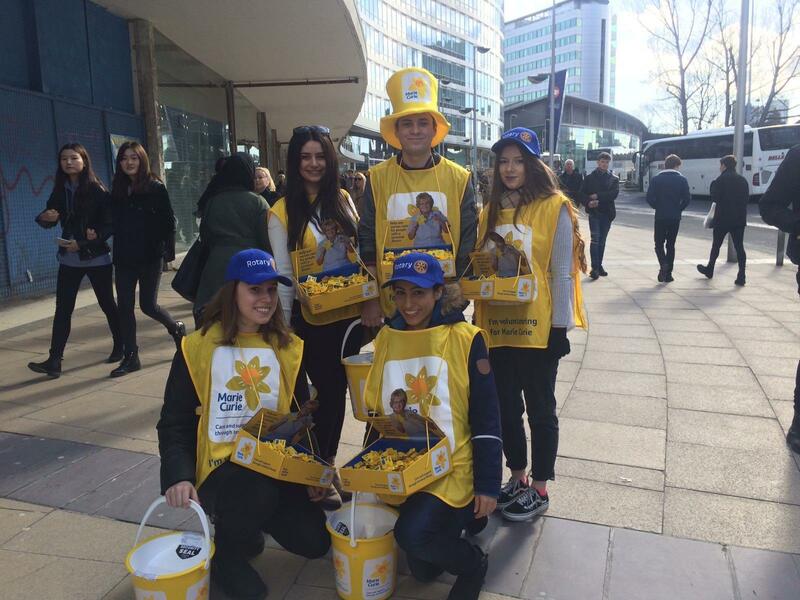 So on the 4th of May 2017, our team of volunteers worked hard all across Manchester City Center for a period of 2 hours and managed to raise £189.71 of a total £1593.04 for the day. To put that into perspective, £180 pays for a Marie Curie Nurse to look after someone with a terminal illness for a full nine-hour shift (10pm-7am), in the comfort of their own home. We would like to thank the Rotaract Club of Manchester International for their support and is a prime example of the power of Rotary in the community.